You’ve never done a glass block shower before. Your contractor has never done a glass block shower before either. Your local suppliers are clueless about the product. You’re not really a lazy person, but you only have so much time left in your crazy-busy day to figure out this part of the project. It’s just one (although important) element in your bathroom remodel. How do you get this shower built without blowing a hole in your budget or pulling out your already-too-thin head of hair? As crazy as this may sound, when you strive to get lazy (AKA being more efficient), this job will go smoother for you and look nicer at the end. In this article my job (and I’m perfectly cool with accepting it) is to give you practical ideas to get this project done efficiently and effectively. I’ll look to cut your research time and installation frustration (hey- that rhythms). My job is to keep you within budget and eliminate unnecessary errors which can come with being a “first-timer.” At the end (in the comments section) let me know how I’ve done and or any other “blanks” you need me to fill in. Now, let’s get to the tips. Inspiration (not taxation) without representation is tyranny. It’s fine to get inspired with pretty images on Pinterest and Houzz. However, if these images don’t lead you to companies (i.e. “representation”) with systems and products to help you get the job done – they are just a big tease, a ‘bait and switch.” You’ve seen something cool – but you don’t have the practical systems and products to make it happen. 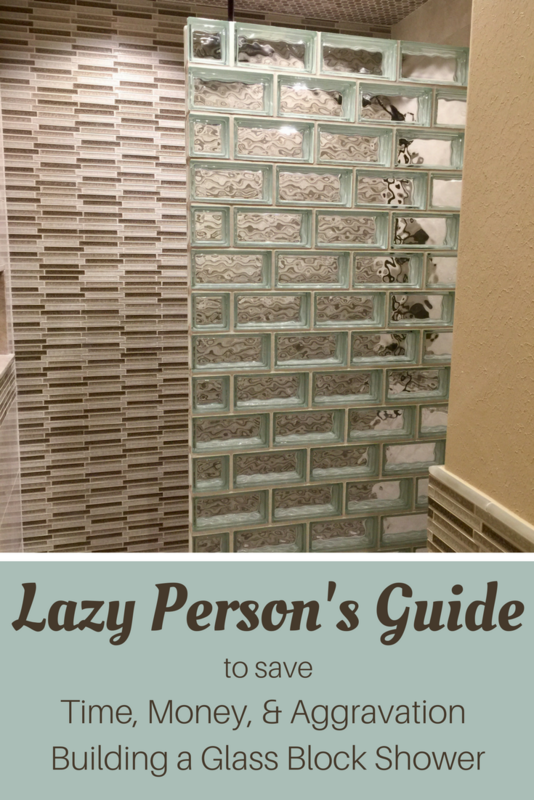 Look for pictures with links on hot-image sites (like Houzz and Pinterest) with links to real live companies who sell glass block shower wall kits. These kits will help you get the job done and simplify the process. 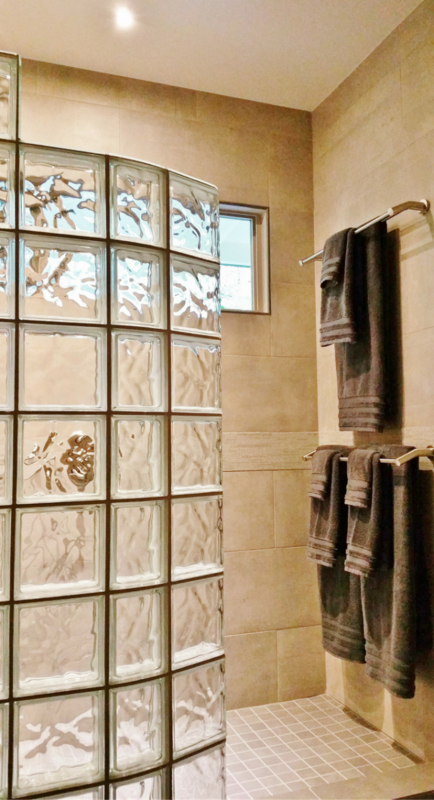 Unless you (or your contractor) are intimately familiar with the sizes, shapes and installation methods of a glass block shower you’re wasting your time (and could end up throwing away big money) attempting to design your own shower. You may ask, “Mike, why do you say that?” Since glass blocks can’t be cut, and the shapes to turn corner and make rounded walls only come in predetermined dimensions, if you design your shower pan without knowing the shape/size of the wall first, you’re cooked! Tip #3 – Buying “pieces and parts” will lead to frustration and time loss. Get a system. Batteries not included. There’s nothing more frustrating than working your way through a project only to realize you don’t have the parts you need – or you’re not sure if the pieces parts you bought will ‘play well’ together. Buying components can be “penny-wise and pound foolish” as my Dad used to say. 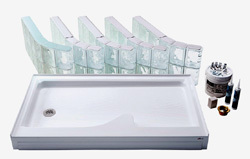 For an efficient glass block shower project get an integrated system. First, you’ll want a shower pan designed to fit your block design. Get the right anchors, silicone and grout proven to work. 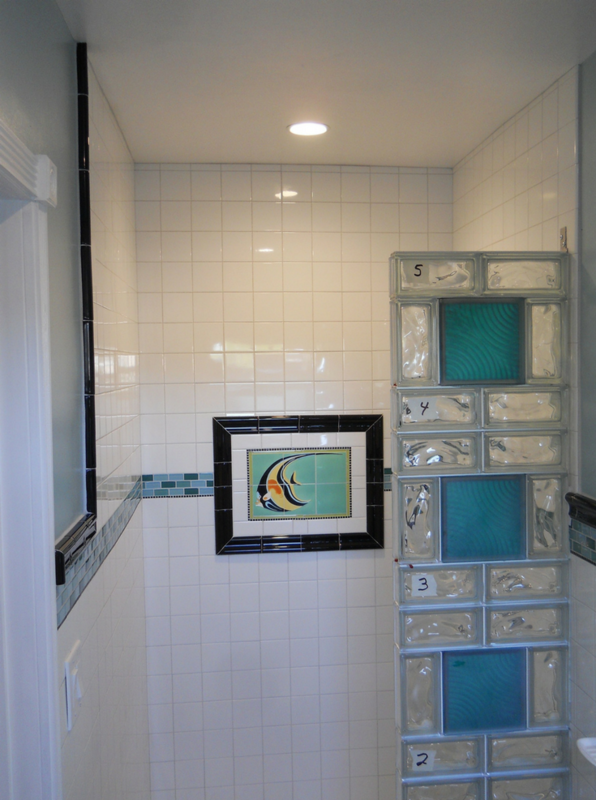 Source premade glass block shower sections to save you (or your contractor) time and money. Buying the ‘pieces-parts’ certainly won’t save you time running around finding them – but even more importantly – it could cost you money if you get the wrong things. Contemporary, curved walk in glass block showers are hot. As a matter of fact, u more than 50% of the jobs I work on are curved walk in showers. What you may not realize is if you want a tile floor and a curved walk in it will involve much more effort and coordination than a straight wall. You may be asking – why? 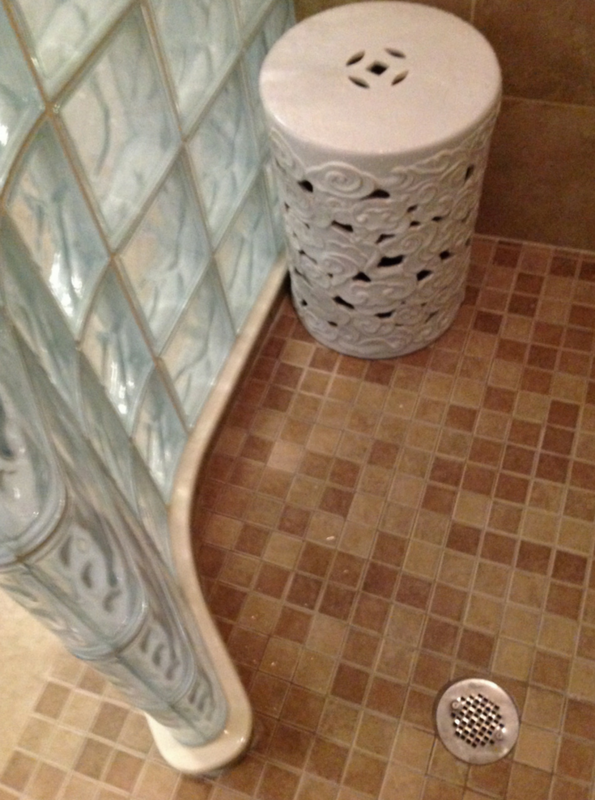 With a curved wall there is also a curved shower curb. Installing tile along a curved curb is a challenge (you can’t use bullnose tiles around a curve). It’s certainly not impossible (as you can see below) to have a tiled shower with a curved glass block. 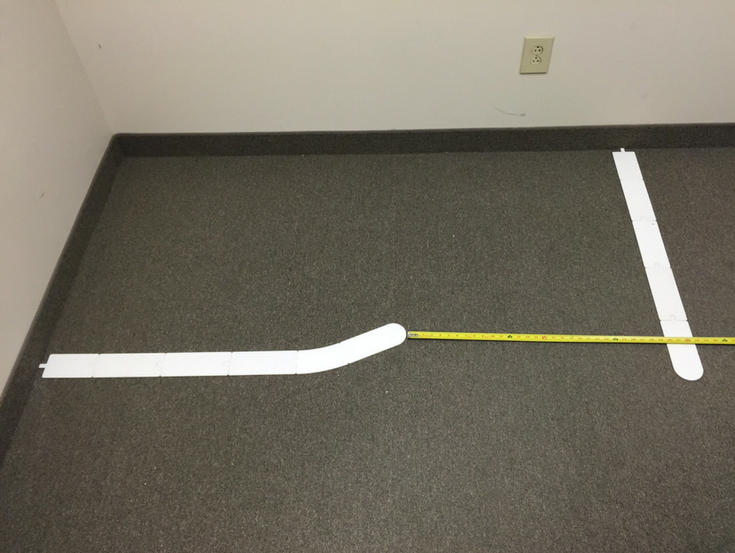 To make this work you’ll need a solid surface curb cap (they are usually 6” wide) to go over the curved curb. These curb caps can set you back between $400 to $700. They are not a cheap date. With a straight glass block wall, you can simply use bullnose tiles up the curb. It’s simpler, easier and more cost-effective. 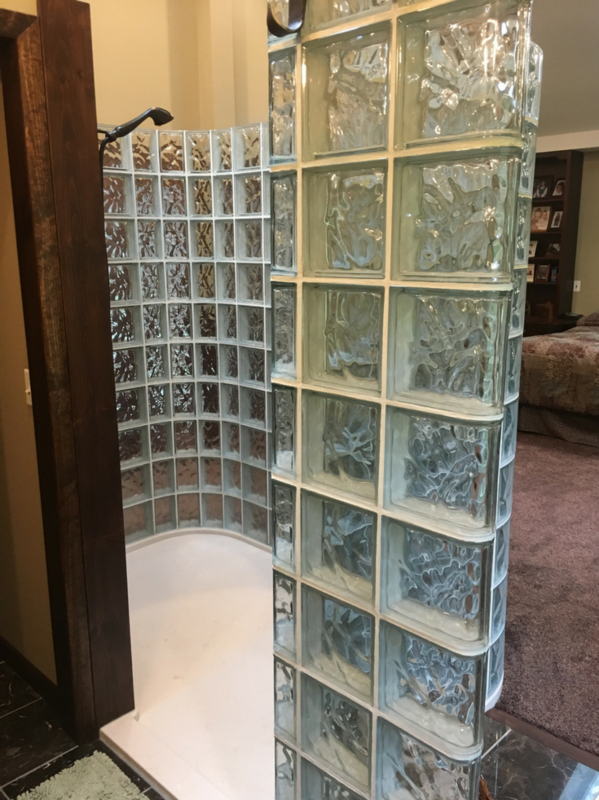 At this point you may be saying – the reason I want this glass block shower is because it’s a cost-effective way to build a walk-in shower. So, how can you find a curved glass block shower wall (and corresponding shower base) which is simple to do? Read on to tip #5. In the old days of glass block showers there were 2 nice (but limiting) sizes (72 x 51 and 60 x 34) of acrylic shower pans which made a curved glass block shower wall installation simple. The problem with this acrylic option is it was too limiting if you couldn’t fit in the big 72 x 51 unit – or you needed a size bigger than 60 x 34. Enter the solid surface shower pan. With this pan you can make any size glass block shower. Whether you want it curved or straight doesn’t matter. There are 51 standard colors (unlike the old acrylic glass block pans available only in white and biscuit). They are pre-sloped to your specific drain location, so you don’t have the cost/aggravation of moving plumbing. This can be a huge benefit for homes with concrete floors. Back in the day when I was an apprentice bricklayer working for my Dad’s masonry company (back then I had a full head of hair and none were gray either!) it was interesting to note with 35 masons on the payroll he only trusted 2 of them (yes you heard that right) – only 2, to install glass block walls. Why was this? It’s because installing glass blocks unit by unit is a pain in the rear. It requires patience. Since glass blocks are non-porous you can’t install them as fast as a brick or concrete block, so most masons hate working with them – and will end up installing them too fast and doing a sloppy job. If you’re tried finding a mason willing to do your glass block shower wall installation, you already know they are not jumping for joy to do your job (if they’ve even bothered to call you back). They will gladly leave the glass block job to someone else. Fortunately, today you can blow off needing a mason to do this job with the “LEGO-block style prefabrication systems.” Using a Protect All glass block shower panel system they are put together in pre-made sections saving time, money – but most importantly, they can be installed by a DIY’er or general contractor. As a guy who should be enrolled in the “Graeter’s Ice Cream/Cannoli Eaters 10 Step Program,” I know the importance of “topping off” the night with the right dessert. I also know ‘topping off’ a glass block shower with the right finishing materials is equally as important as ice cream (OK – maybe I lied there!). 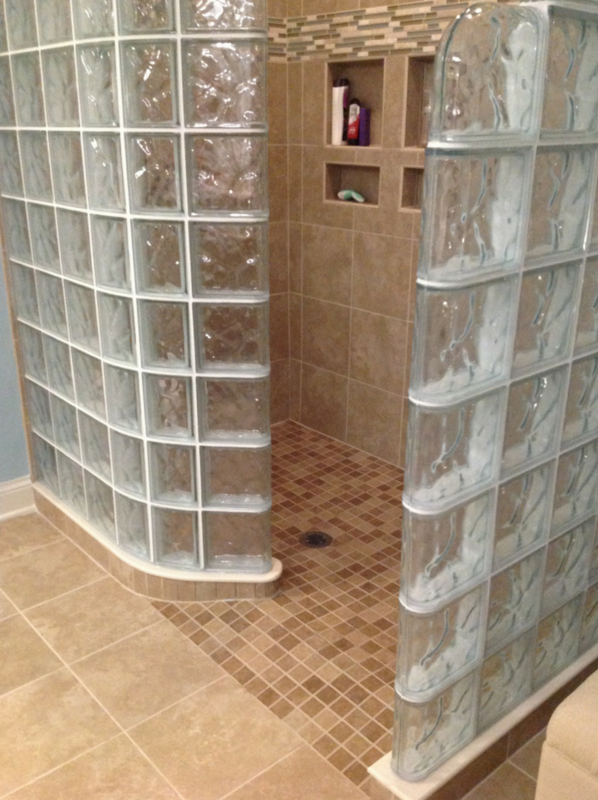 There are lots of errors made with glass block showers. Most people don’t know the right adhesives, grout of mortar to use. When you invest in a glass block shower system I would recommend either a sanded or urethane grout (when using premade Protect All panels). Don’t get fooled into thinking building a silicone free-standing wall is a good idea. It will move and give (not a good thing). In addition, when you’re adhering your block wall to the tile or shower wall panels on the side don’t grout them in. If you grout them these joints can crack when the home settles. Instead use either silicone or a grout-caulk between the blocks and the side walls. You shouldn’t have to kill yourself researching this job, finding a “needle-in-the-haystack” mason contractor to install for you, or trying blindly to figure this out on your own. 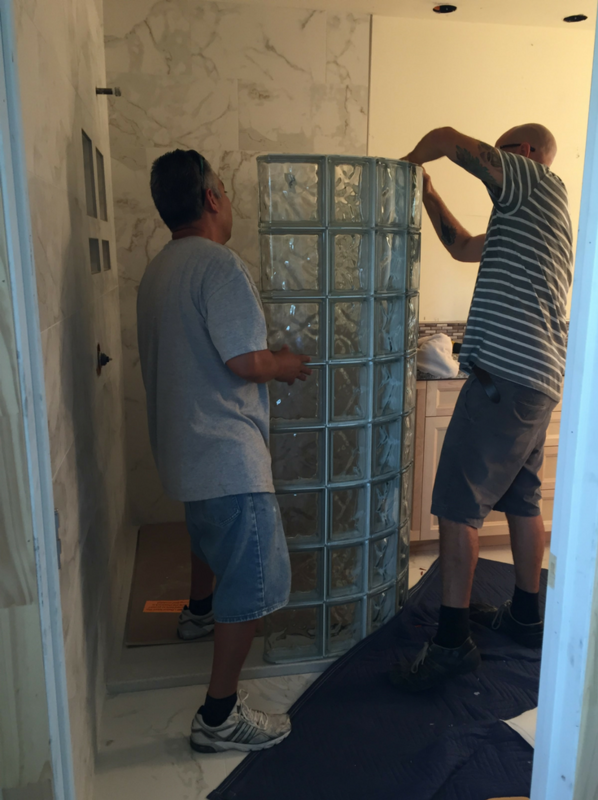 A glass block shower job is simple to do if you get inspiration and design advice from experts who specialize in this product. Makes sure to source easy to install shower kits and shower pans designed specifically for your job. 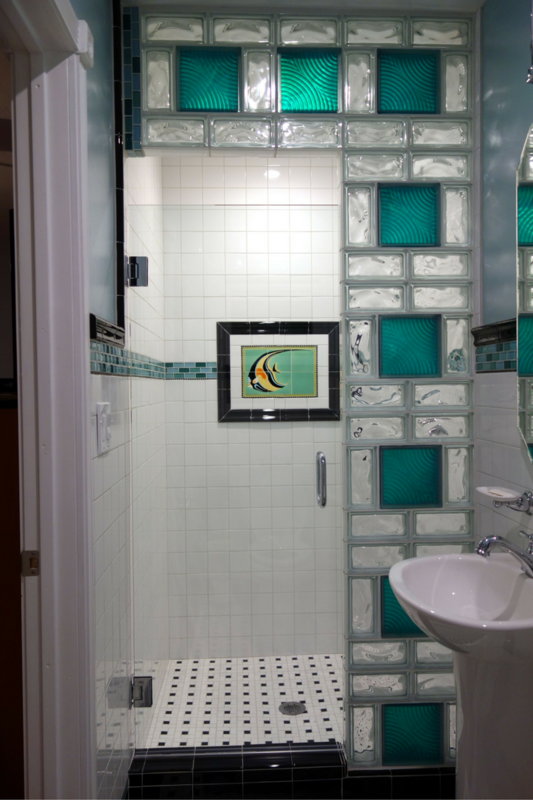 Don’t get psyched out of doing a glass block shower. It’s not confusing – IF – you know who to call for help. If you want someone to guide you through the glass block jungle of products and systems, contact me or my team Innovate Building Solutions at 877-668-5888. We can help you design the shower and supply prefabricated glass block shower walls and base systems. For a local installation service and supply contact Columbus Glass Block at 614-252-5888 or Cleveland Glass Block at 216-531-6363.